*This, our slow but steady melting season, is normal...alas. So the photo above fits...sometimes the changes can occur even faster ... all in one day...like this past weekend... well, everything but the warm part...This added defrosting time has been put to good use. It has allowed me to pursue a few unfinished projects. People ask how do you get everything in if/when you leave the Island? It can be a bit of an organizational nightmare but one can get much in if one plans ahead... I do try... this week it was my Spring (medical) Fling.It was a little sunnier there...perhaps my reward for getting a plethora of appointments accomplished at one time... however, much melting was in progress on the Island. Returning, it was nice to have a little more time, given the late boats starting this past Friday. Not too many cars on the 7:45 boat but it's a start. The extra time let me pick up some pansies. Time to get my fingers dirty! At this point, it's an indoor project. As I write this, the April showers have turned to snow showers... hard to see in this photo but trust me, it's there! So I will continue to work with cuttings and cold weather hardy plants inside...for now. Do note, the weather has been fickle this weekend with the snow turning to rain...the sun even showed up Sunday afternoon and we spied some little green daffodil tips coming up through the leaves at the Cottage. So Spring is moving along, Island style. the crystals have found places in newly designed pieces. Just seeing them makes me smile. I will cherish the memory they imbue. My thanks to Laura Findlay Hagen for her patience and her expertise. I think Grandmother would be happy to see her gems in use again. Lastly, as the Season starts to gain a foothold and I shift to thinking about the Cottage Spring Cleaning, this last week has allowed me to pause and take care of another loose end. I saw a note when I was in Illinois that stated hundreds of people on transplant lists lost their lives there in the last year. April is donate life month nationwide. Consider signing up. Washington Island Community Blood Drive Thursday April 11 @ the Community Center Gym from 10:00am to 2:00pm...sponsored by the Washington Island Student Council. "Singing for Seniors" Saturday April 13 @ the TPAC, 7:00pm... Lloyd Michalson, David Hatch, and Lynn Gudmundsen sing old time gospel music. Admission is free to Seniors! Sportsman"s Club Annual Wildlife Fundraising Banquet Saturday April 20 @ Karly's. Proceeds go to the pheasant program and the planting of clover and corn to feed Island wildlife. The First Car Wash of the Year! April 27 from 10-1pm, School Parking Lot... The DC group will be having a car wash in the school parking lot. Sue says,"Let's get old man winter off of our cars!" Help support the group as they raise funds for their trip to Washington DC. Island Party! April 27 @ Karly's...it's the 60th Anniversary of this event! Theme: Turn Back Time. What was going on in 1953? Come and see...Lois is cooking and Elvis will be making an appearance. Proceeds go to support the Community Center and other community projects. Heads up on Memorial Day weekend - The DC Trippers will be having a rummage and car wash, so as you are Spring Cleaning, think of donating your finds to this great cause. If you have items please contact Sue Cornell. Looks like April is going to be busy! 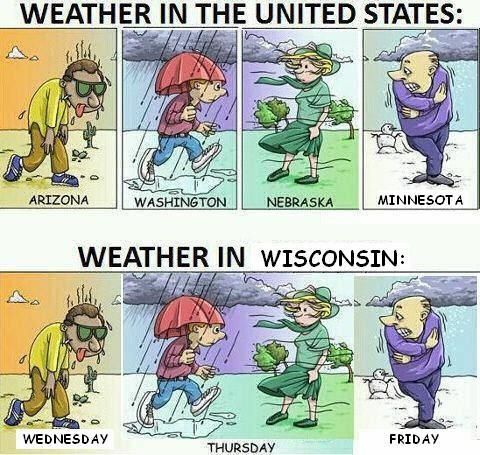 * Re the Weather "Art"...this came from a Friend through Facebook. Have looked and looked and still am not sure who should get the credit. Those who know me may think I go overboard to note sources. However, I do think it is important...if someone recognizes this, do let me know! Newer Posta world of books...oh yes!